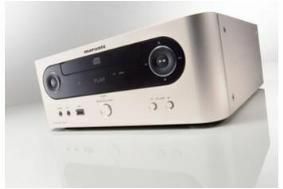 Marantz debuts hi-tech all-in-one system | What Hi-Fi? These can be used to drive two sets of speakers in different rooms, can biamp suitable biwirable speakers, or can be bridged to give a conventional 2x50W power output. The system, housed in an aluminium case with a gloss black fascia, offers 50 radio presets, an analogue auxiliary input alongside that USB socket on the front panel, and a headphone output. Alarm and sleep functions are also provided, and the casework is designed to conceal connections to the rear panel, which extend to two line inputs and a line-out, a subwoofer output and a connection for system remote control. There's also a detachable mains cable.